What kind of papers does IJARIIT publishes? 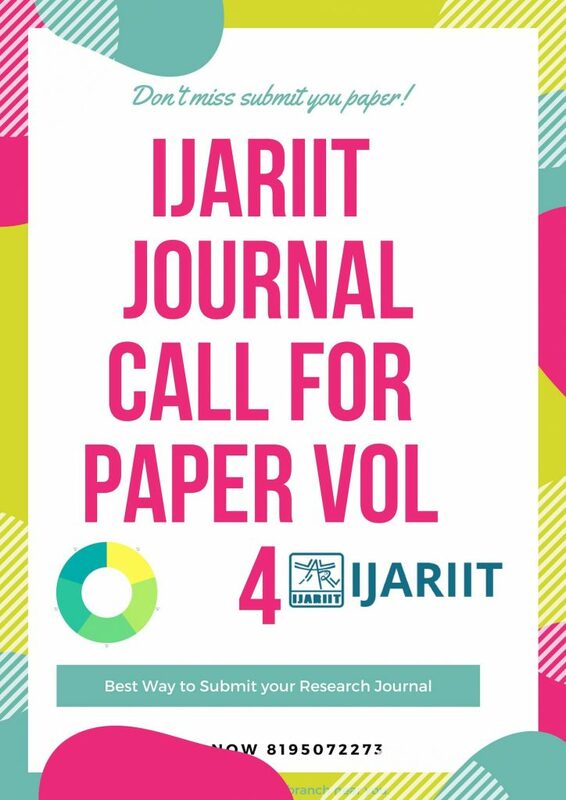 IJARIIT is a scholarly online, open access, peer-reviewed, interdisciplinary, bi-monthly, and fully refereed journal focusing on theories, methods and applications in technology and relevant fields. It publishes research papers, review papers, thesis, dissertations, abstracts and other formats. The ISSN of the journal is: 2454-132X. What is the Impact factor of your Journal? What is the indexing of IJARIIT journal? Indexed journals are considered to be of higher scientific value as compared to non-indexed journals because of the quality parameters undertaken to verify the originality, importance, timeliness, accessibility, grace and quality of research work done. We take utmost care while accepting and publishing any paper and hence proudly announce that we are indexed in more than 15 esteemed online directories followed by Google Scholars, Cosmos, DOAJ, DJIR and many more. Please refer the following link to know more about the indexing of IJARIIT. What are the general guidelines for writing a manuscript? You can find the guidelines for manuscript preparation under Author Guidelines here . How long does it take to publish the paper? Average time to publish a paper is 2 days – 3 weeks. Depending upon the complexity of the paper and deadline of the author the publishing time may vary. Need it fast? When will I receive the acknowledgment for my submission? If you submit paper online then you will receive acknowledgement via email and SMS instantly within few minutes of submission. It is suggested that you submit your paper online as it will directly input your paper in our database for further processing. In case submit your paper via email, then the acknowledgement may take up to 2 working days. 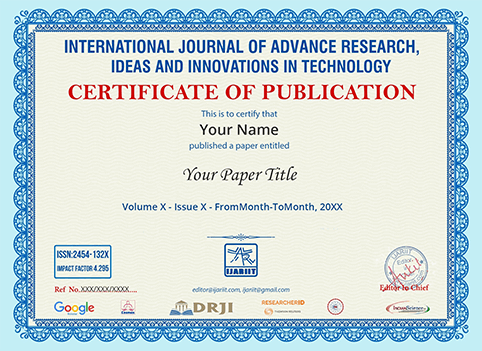 A first acknowledgement will provide you with a unique paper ID and tracking code to track the status of your paper during the process of publication. What is the sample paper format for publishing in IJARIIT? You can see the sample paper format here. Can I track the status of my submitted paper? What is Copyright Form and how to submit it? Copyright Form is a proof that you are the rightful owner of the paper and you are giving the rights of publishing the paper to IJARIIT. The copyright is needed once your paper is approved after peer-review. Once approved, you will be notified by email requesting you to submit the copyright form and the publication fee. The email will also have a unique ID along with a link to use that ID on. Once the link is used, a pre-filled copyright form with all your details that you have provided to us will already be there. You only need to verify your details. Once the details are verified, the next step will ask you attach a copy of any of your Govt. approved ID proof with the address (Refer the list below). Click submit after attaching the ID and the process is complete. The next step is the payment of the fee. The journal charges the publication fee of Rs.1800/- from students and for others the charges are Rs.2200/-. The publication fee for foreign authors is $60 which can be paid by PayPal. Refer to this link for more information. Why do you charge for publishing a paper? Publication fee is the fee for the maintenance of the journal and for keeping it indexed in various indexing services like Google Scholar, Thomson Reuters, DRJI and many more (Refer to indexing page for more info). You can pay publication fee by one of the following ways. Authors can pay online by ‘Instamojo’ using their Debit/Credit card. Payment by Bank deposit in the Given Account Number. Foreign Authors: Can pay via PayPal or Direct Wire Transfer. Is there any restriction on number of pages? Technically there is no restrictions on the numbers of pages. However, extra charges will be levied if the number of pages exceed 10. What is the fee for extra pages? We charge extra Rs.100 per page if the total number of pages exceeds 10. E.g. if your paper is of 8 pages, then Rs.1800 (assuming you are a student) will be charged and no extra charges are levied but suppose your paper is of 12 pages, then Rs.1800+200 will be charged (Rs.100 per page over and above 10 pages). How to apply for soft copy of certificate? You do not need to apply for the soft copy of the certificate. Once your paper is published, you (and all co-authors) will receive their copies of certificate on their respective emails. What certifications do you provide? 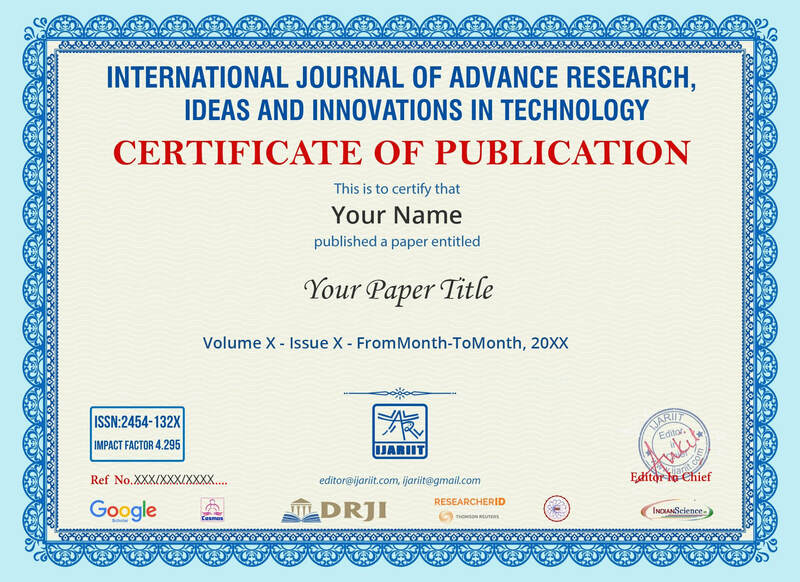 We provide the softcopy and hardcopy of the certification, which is a document mentioning that the paper has been published with IJARIIT under our ISSN and duly signed by the editor-in-chief of the journal. Do you charge for the hard copy of certificate? Whereas all the soft copies are provided free of cost, the hard copy of certificate bears a cost of Rs.600 per copy. E.g. if there are 2 authors of a paper and both want individual hard copy, then fee of Rs.1200 (600+600) will be applicable. How to apply for hard copy of certificate? How long does it take to receive the hard copy of certificate? We send all certificates through DTDC courier services, however, if these service providers do not serve in your locality, then we use Speed Post or Registered Post of Indian Postal Services. After publishing of the paper, all the requested hard copies are released within a week. Depending upon your geographical location, the certificate receiving time may vary. Do you provide hard copy of the journal? No, the journal is an online only journal. We do not provide the hardcopy of the journal. Instead, we provide an e-magazine of the edition to all the authors of that edition. To view an e-magazine, please visit this page . How can I submit my thesis for publication? You can submit the thesis by following the same process as submission of the paper. Although, peer review is entirely a subjective process and thorough review can take up to 5 weeks, yet an average complex and properly formatted paper can be reviewed in 3 days times. The process can also be expedited if the author has some deadline to meet.